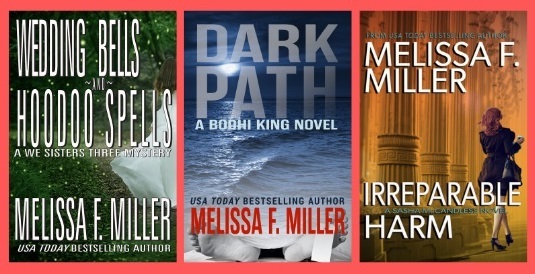 Former attorney Melissa F. Miller is a USA Today bestselling author of more than 25 bestselling legal thrillers, suspense thrillers, romantic comedy mysteries and forensic thrillers. Her books share two common threads: pulse-pounding, tightly plotted action and smart, unlikely heroines and heroes. Born in Pittsburgh, Melissa followed life and love to Philadelphia, Baltimore, Washington, D.C., and ultimately south central Pennsylvania. But she secretly still considers Pittsburgh home. As a lawyer, she clerked for a federal judge, practiced in the offices of major international law firms and ran a two-person law firm with her lawyer husband. Now, powered by coffee, she writes legal thrillers and homeschools her three children. More than 1 million readers have downloaded Irreparable Harm, the first book in her 11-title Sasha McCandless series. Twisted Path, Book 4 of her Bodhi King series, is set to release Feb. 19. Her most recent release (December) is the fifth story in the We Three Sisters romantic mystery series, Wedding Bells and Hoodoo Spells: Sage's Wedding. Melissa talks with host Patricia McLinn about source envy, how deadlines affect your writing, and what to do when you're ready to throw out your half-written book. Thank you so much for listening. We hope you enjoyed the podcast enough to want to support us for future episodes. You can do that with as little as $1 a month — that’s only 25 cents per episode! What a deal! — by pledging at Patreon. It’s vital to Authors Love Readers to have your support. Thank you!